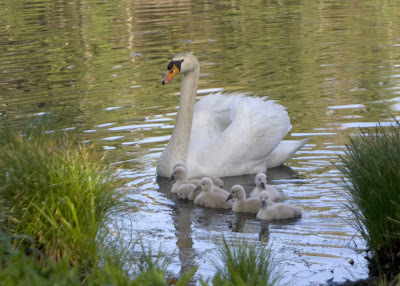 Yesterday morning I took these photos of the swans and their babies in my friend's backyard pond. She threw a little bread in the water, and they came right over and posed for pictures for at least an hour. I have many other beautiful photos, but I wanted to show you these cute little swans, and these were the best shots to do just that. I tried to use a tripod to get better focus, but they were moving around too much, so I had to abandon that idea and shoot hand-held photos. These are great! 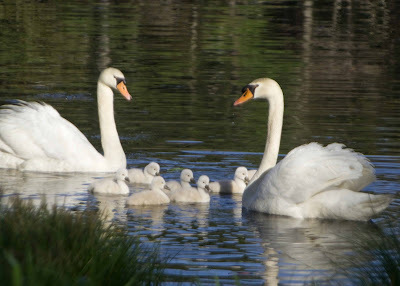 I too was lucky enough to capture some swans and their babies. After months of waiting and watching for them..they disappeared the day after they were hatched. That's too bad about the babies. I think some of these babies disappeared, also. That's nature, I guess, but it's still very sad.